The personal history of Charles R. Fenster — "Charlie" to anyone who has ever met him — will always be intertwined with that of the University of Nebraska-Lincoln's High Plains Agricultural Laboratory (HPAL) north of Sidney. Figure 1. 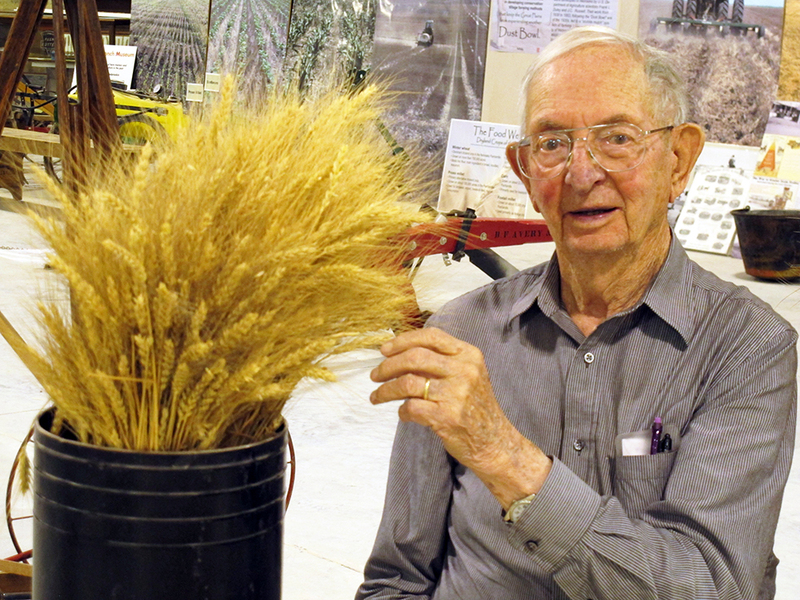 At 96, Charlie Fenster is still engaged in agricultural education in the Nebraska Panhandle. He will be honored Aug. 11 at the High Plains Agricultural Lab near Sidney when its new headquarters building will be named in his honor. The Aug. 11 HPAL Field Day will begin with a welcome and lunch at noon at the new headquarters, followed by the building dedication and tours of research plots until 4 p.m.
Fenster, now 96, was a dryland cropping systems specialist for UNL at the Panhandle Research and Extension Center from 1956 until retiring in 1982. He was faculty supervisor at HPAL from its establishment in 1970 until he retired 13 years later. Fenster's contributions will be formally and permanently recognized Aug. 11 when the new headquarters at the High Plains Ag Lab will be named the Charles R. Fenster Building. Following the dedication ceremony, there will be a tour of HPAL research plots as part of the HPAL Field Day. Although he retired more than 30 years ago, Fenster remains active. On most days he can be found at the Legacy of the Plains Museum in Gering, where one of the exhibits tells the story of the development of conservation tillage in dryland farming — a story in which he played a big role. He also attends field days and similar events when he is able. Fenster's research at HPAL on dryland farming practices has had a widespread and lasting impact on wheat yields, soil and water conservation, and profitability. His work helped transform how dryland farmers raise crops in the High Plains, moving from the original wheat-black fallow rotation, which was associated with dust storms and severe wind erosion, to the more productive, sustainable conservation tillage systems used today. He worked with colleagues in UNL's Institute of Agriculture and Natural Resources (IANR), the U.S. Department of Agriculture Agricultural Research Service (ARS), and other land-grant universities. A Chappell native, Fenster taught vocational agriculture before going to work for the USDA Soil Conservation Service (later to be renamed the Natural Resources Conservation Service). In 1956 he joined UNL to address soil and water management problems of dryland farming in the Panhandle. He operated first from the Box Butte Station at Alliance (since closed), then the Scottsbluff Station at Mitchell, and finally at the Panhandle Research and Extension Center at Scottsbluff. Wheat farmers came to regard Fenster as the authority in dryland crop and soil management. In 1966 Fenster became a full professor and extension agronomist. Work by the Cheyenne County Rural Area Development (RAD) Committee, especially its crops committee, and representatives of the University of Nebraska eventually led to the Sioux Army Depot (1942-1967) being acquired, repurposed and dedicated in 1970 as the University's High Plains Ag Lab. UNL received 2,400 acres of land (one-third in dryland crops and two-thirds in pasture); 14 ammunition storage igloos, each 50 feet in diameter and made of reinforced concrete and covered with 3 feet of soil; two warehouse buildings; and the 42-by-114-foot headquarter building. The HPAL research program emphasized efficient use of soil and water to optimize crop yields under the semi-arid conditions of the High Plains. To help ensure research goals met grower needs Fenster worked with a local advisory committee. Scientists and graduate students from agronomy; plant breeding, physiology, and pathology; soil fertility; irrigation; entomology; weed science; marketing and economics; and livestock nutrition conducted studies at the site over the year. The new building being named for Fenester will serve as a headquarters for dryland research and extension work as well as facilitate enhanced work with ag industries. Each year 50-60 research trials are conducted at HPAL on 27 fields ranging in size from 22 to 36 acres. Various cropping systems are represented, including summer fallow, no-fallow, minimum tillage and no-tillage, to simulate the methods used by area farmers. In 2006, 75 acres were certified for organic production. A 15-acre, lateral-move irrigation system enables scientists to simulate different precipitation patterns. Recent improvements in equipment include a continuous flow dryer and grain storage system that allow direct harvest of proso millet and emerging alternative crops with a stripper header. HPAL is a satellite unit of the Panhandle Research and Extension Center at Scottsbluff, where Jack Whittier is research and extension director. Perhaps the biggest impact of HPAL, according to Fenster, has been the information gathered from a long-term soil management study established in 1970, overseen by Fenster and Gary Peterson, now-retired soil scientist from Colorado State University. The plots compare winter wheat and soil parameters (such as the fate of nitrogen) in a variety of tillage settings, including moldboard plow, sub-tillage, and no-tillage fallow systems. A native sod treatment has been maintained. The long-term study has yielded a bumper crop of data and more than 100 publications. Since retiring, Fenster has remained active in Nebraska agricultural circles and Univeristy of Nebraska groups. He has been involved in the Farm and Ranch Museum (now Legacy of the Plains Museum) in Gering since its inception. In 1983 Fenster was inducted into the Nebraska Hall of Agricultural Achievement, and in 1991 he was recognized as an honoree for the Nebraska Hall of Agricultural Achievement. In 2000 he was recognized as an honoree for the Nebraska Agribusiness Club Public's Service to Agriculture Award and in 2008 he was awarded the Outstanding Service to Panhandle Agriculture Award. Charlie and his late wife Eunice have been major contributors to the University of Nebraska-Lincoln and University of Nebraska Foundation. In 2005 they endowed a major gift to establish an endowed professorship at the UNL Panhandle REC.